This is the area where the Bangor Fire started on April 30, 1911, in a hay shed belonging to J. Frank Green on lower Broad Street. It is theorized that participants in an impromptu poker game dropped a cigarette and started the blaze in the afternoon. 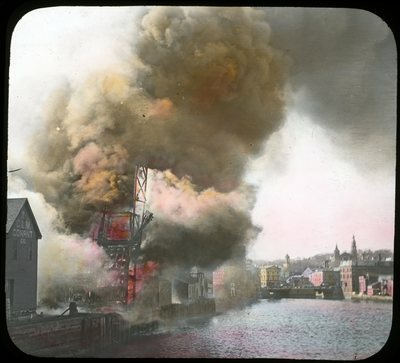 The fire quickly leapt over the Kenduskeag Stream and wreaked havoc downtown throughout the evening. "View from Railroad Bridge" is written on the image.